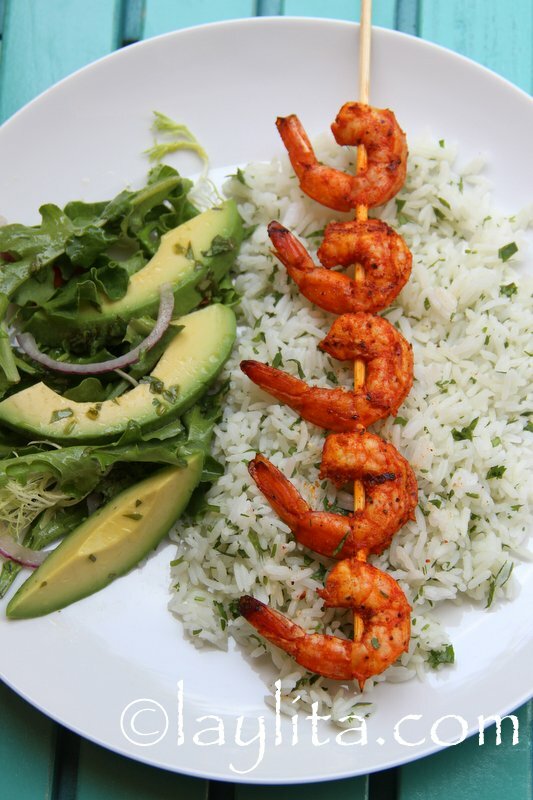 These easy grilled shrimp skewers or pinchos de camaron are made with shrimp marinated in spicy passion fruit achiote sauce. This dish has several of my favorite ingredients. 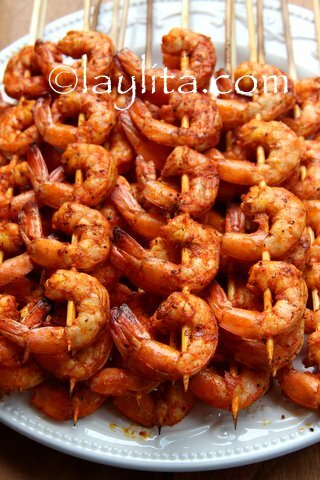 First of all, I love cooking with shrimp. They can be used in so many different types of dishes: ceviches, salads, empanadas, rice dishes, soups, etc. I’m also a huge fan of maracuyas or passion fruits – just in case that isn’t obvious yet. 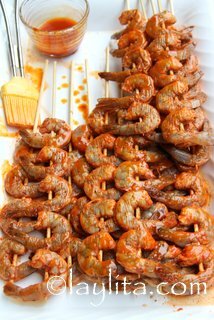 And I find that passion fruit + shrimp are a wonderful combination, so I prepared a passion fruit marinade for shrimp. The marinade also has another of my favorite ingredients: achiote. Achiote is also known as annatto and is a red seed, which can either be ground or used to infuse oil/butter/lard for cooking. It has a rich red color and a subtle earthy flavor. Achiote is used in so many Ecuadorian and Latin dishes, in Spanish we also refer to it as “color”, because it adds color to the food. 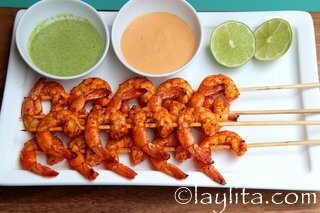 Delicious recipe for grilled shrimp skewers made with shrimp marinated in spicy passion fruit achiote sauce. 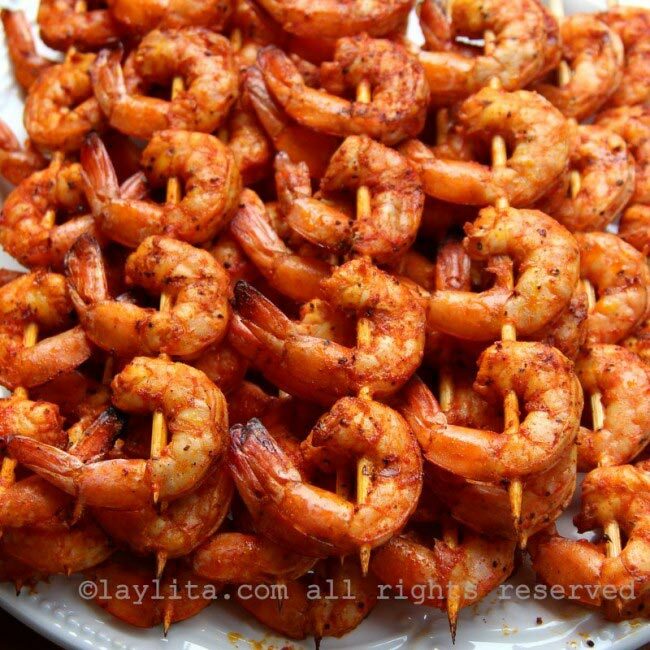 Serve as appetizers or as part of a main meal. 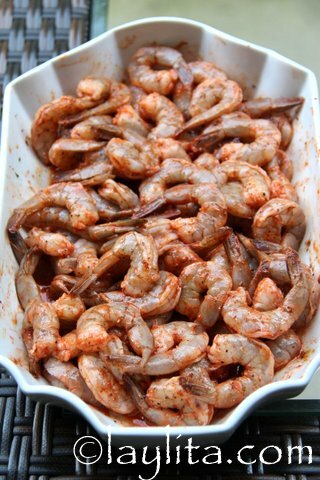 Marinate the shrimp with the passion fruit adobo or marinade ingredients for at least a couple of hours. 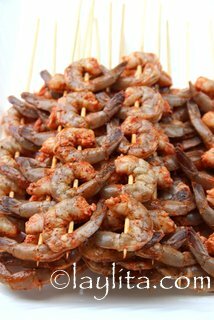 Put the shrimp on the skewers, for a main meal put 5-6 on each skewer and for an appetizer put 3-4 on each skewer. 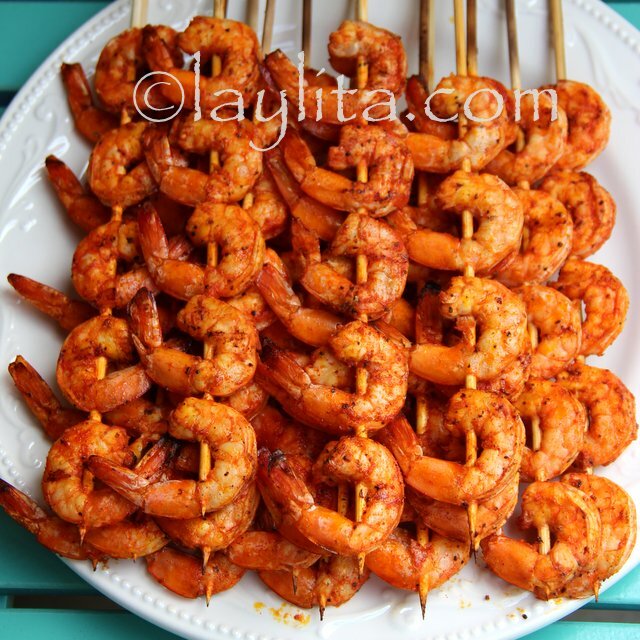 Brush the shrimp with the melted butter achiote right before grilling. 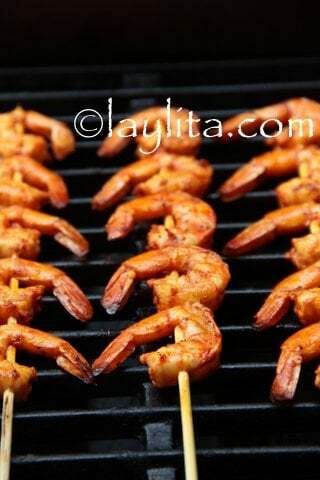 Place the shrimp skewers on a hot grill, grill for about 3-4 minutes on each side or until the shrimp are fully cooked. Baste with the achiote butter as needed. Exact cooking time will vary based on each grill and size of shrimp. 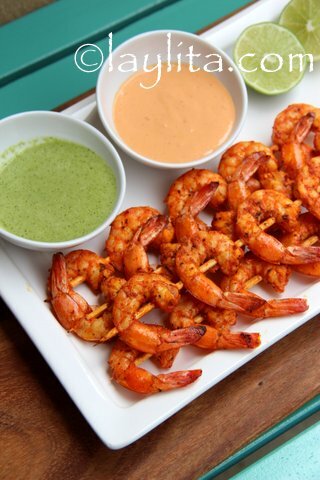 Serve with lime slices and dipping sauces, with your choice of sides, or on top of your favorite salad. The weather is finally starting to warm up, which is perfect for grilling. 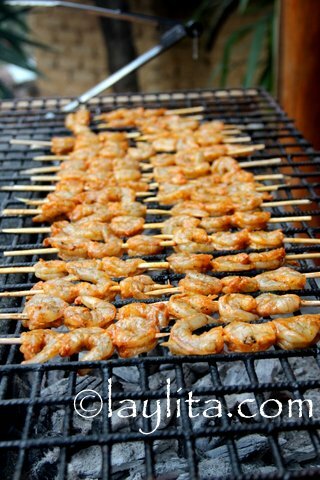 I usually prepare these grilled shrimp skewers during the summer months. 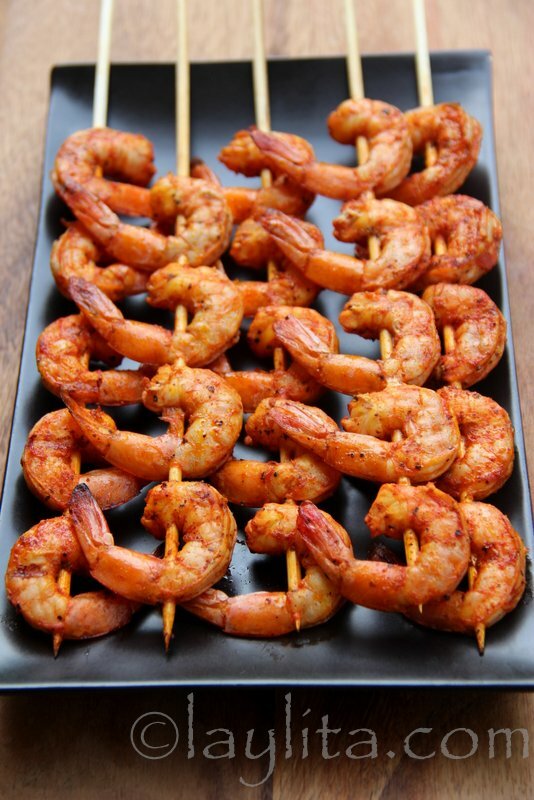 When I started making them I used orange juice in the marinade. Last summer in Ecuador, I went crazy with all the delicious fruits and bought a ton of passion fruits. 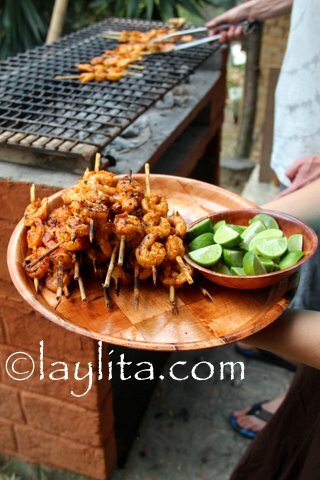 My brother Ramon was having a barbeque at his place and I wanted to make pinchos de camaron or shrimp skewers. However, instead of using orange juice I decided to take advantage of my maracuya bounty and use passion fruit juice in the marinade. 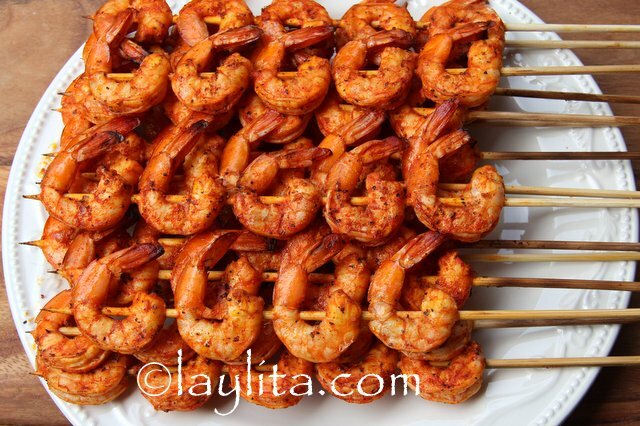 These grilled shrimp skewers can be served as appetizers with dipping sauces. I like to serve them with a jalapeño cilantro salsa and a creamy chipotle sauce. They are also a great match with this spicy avocado salsa. 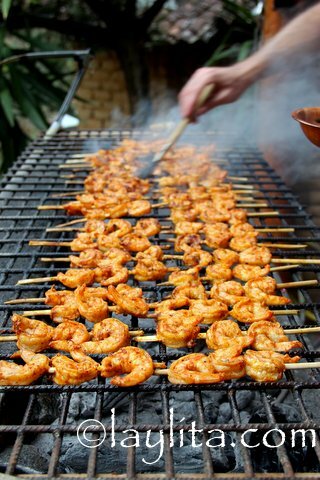 The grilled passion fruit shrimp can also be served as part of main meal. 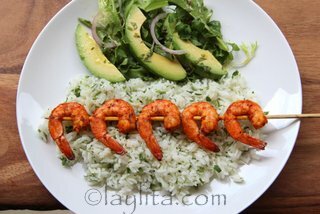 One of my favorite meals is cilantro lime rice topped with grilled shrimp, with a small salad and some patacones or tostones plantain chips on the side. These skewers also make a great topping for your favorite salads. I’ve added them to my mango avocado arugula salad for a light lunch or used them to take my basic garden salad to the next level. For a filling but healthy entree salad serve them over this quinoa salad with pickled onions. 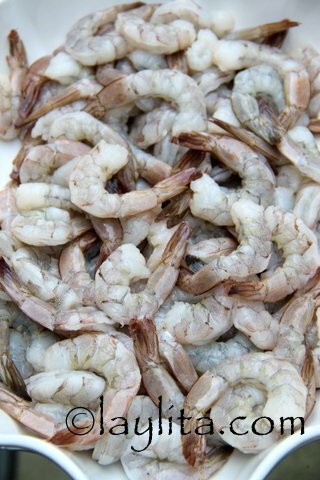 They also work great for shrimp tacos, just top with pickled red onions and avocado slices. 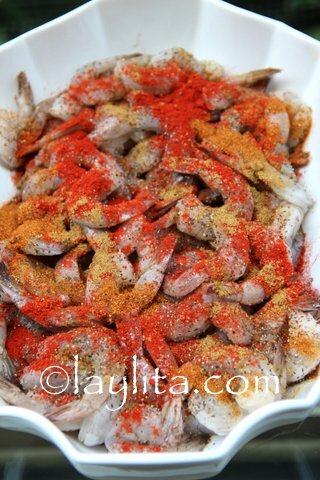 Do you have a recipe for camarones al ajillo? Or anything al ajillo for that matter. It was definitely one of my favorites every time I went to coast in Ecuador. It’s on my list of recipes to add to the site.